Respectable humans maintain tidy, shame-free kitchens and under no circumstances let the sink turn into the dirty-dishes edition of Jenga. That would never, maybe, definitely not happen to you or anyone you closely associate with. Neither would letting a small village's worth of produce rot, or any of these other gross habits that would resonate deeply with other people that definitely aren't you. 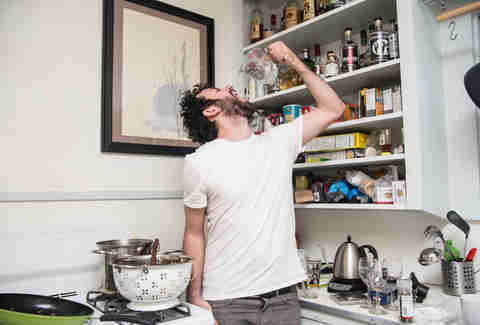 Everyone has been at a college party where the glassware runs out and some doofus in a Sublime shirt pours whiskey into a measuring cup. 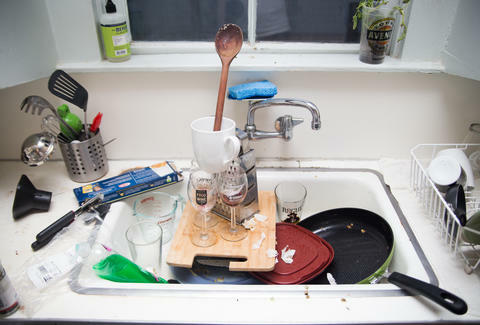 But this also happens on random Tuesdays when you forget to run the dishwasher and hand-washing is just too ambitious. One of the easiest places to throw rarely used items is under the sink, but this land of derelict junk is a sure sign of faux adulthood, to be honest. Organize it, and while you're at it, hit these 13 other areas you've never thought to clean. Saving a handful of pasta for later is a thoughtful and practical decision, until it's placed in a gallon-sized tupperware container because everything else is lost to the dark and moldy corners of the fridge. Extra man/womanchild credit if the lid is missing and replaced with aluminum foil. A tub of ice cream is supposed to be a happy place, not a shadowy cavern of stalactites and crystal formations that look like they belong on a hippie's bedside table. We all should throw that tub out after two to four months, but we won't. 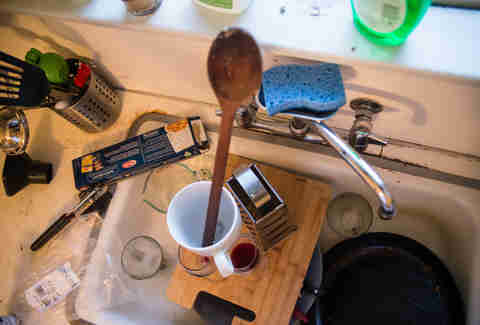 Sure, we all let the dishes slide sometimes, but the tipping point of unacceptability is when the sink becomes a game of Jenga where branded wine glasses balance precariously underneath coffee mugs and the only thing keeping the sink from turning into a pile of broken glass is the structural integrity of a cracked cutting board. It's fine though -- just wave a hand towel at the fire alarm to make it stop. 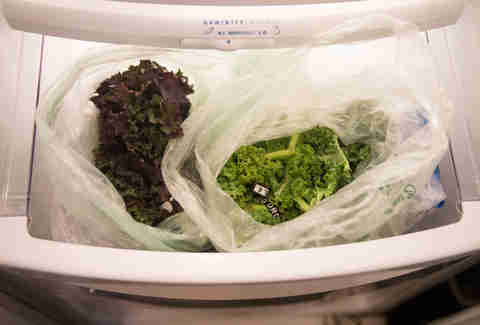 Kids around the world starve every day while feckless Americans go about wishfully buying bunches of kale, spinach, and broccoli in the same grocery trip, before letting them wilt to a black gravy in the part of the fridge that appliance makers poetically dubbed "the crisper." Aside from rotisserie chickens, frozen pizzas are the greatest value-to-effort ratio the grocery store has to offer. Which is why it's so tempting to stockpile your freezer with a six-month supply of pepperoni-and-sodium discs. 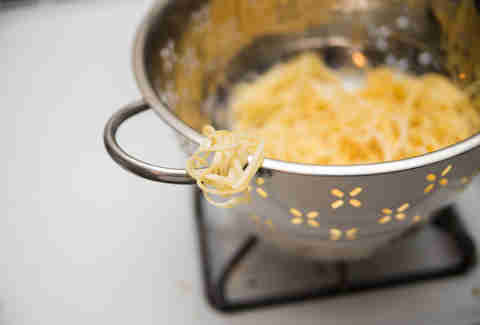 Palming mouthfuls of fresh spaghetti straight from the strainer is a little life treasure that no adult should deny themselves, but once spaghetti has sat for an hour, that cold, crusty mess should probably go in the refrigerator. You better go out and get one right now, dude. No kitchen should be without one. Purchasing a bottle of salad dressing feels great. It's an investment in eating something green, with the secret knowledge that it's abhorrently unhealthy. 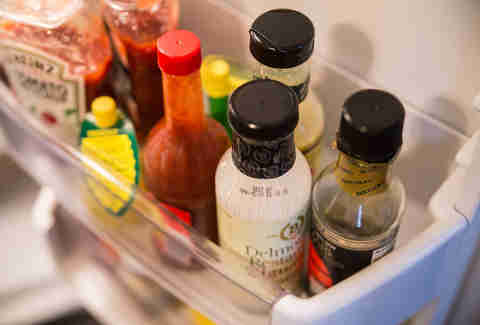 Self-deception is acceptable, but what's not is when those salad dressings and hot sauces and marinades form a collection of expired condiments that look like they belong in Edward Norton's fridge in Fight Club. There are three ways to defrost meat: the long way in the sink, the short way in the microwave, and the embarrassingly incomplete way in your mouth. 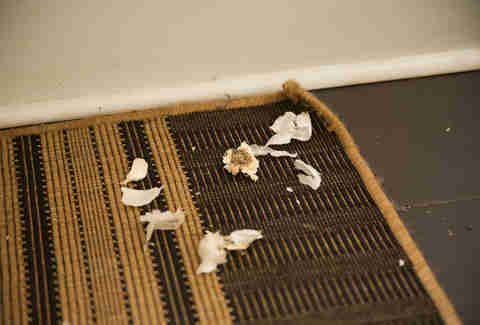 Garlic skin won't bring you to tears like onion skin, but it does drift off of any cooking surface and float like a stinky feather into every corner of your kitchen. We all need a little more respect for Teflon. 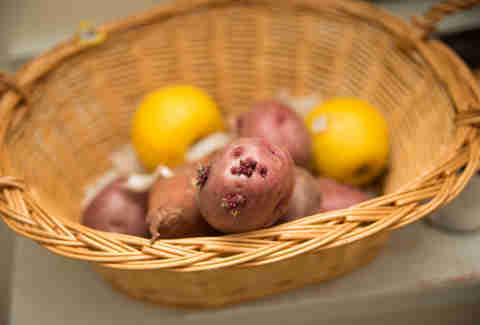 Is it a mystery to you why potatoes never become crispy, onions don't caramelize, and fried rice is a soggy mess? This is because squeezing five meals' worth of food into one pan does not distribute the heat properly. Pro tip: wash one of the other pans and use it. The vegetable basket should not look like a forest of intertwined garlic tendrils and potato sprouts feeding on a compost pile of browned lemons and limes. But it definitely sometimes does. A salty aged cheese like Parmesan is not a great replacement for cheddar on a late-night bean burrito. Trust me on this one. Because the normal pan was already used. To cook eggs. Yesterday.